Prodigy Moving & Storage is distinguished and reputed moving company of entire California area, serving the residents with their full fledge and enormously good moving services. The company is fully licensed and insured one dealing all types of move that includes residential, commercial, and local or long distance. Be it a small or a huge move, they are capable of doing it all that too with full efficiency and hard work. The company has a wide variety of moving services to make your move done in a more easy and professional and the best part is that all their services are available at low and reasonable rates, thus enabling you to enjoy an exceptional moving experience in the most affordable prices. All the services are offered by the team of their talented and professional movers who are impeccably perfect in handling each and every type of move making it fully stress-free and successful in real terms. They have full time professional and hard-working employees who are devoted to offering you excellent moving services along with helpful assistance and support during the relocation process. Both, the office staff and the onsite movers at Prodigy Moving and Storage are highly knowledgeable and qualified in performing their respective jobs rightly. They will carefully pack and deliver all your items to the new location at right time and also ensures proper safety and security of the goods so that each item reaches the destination undamaged. Other than this, the company also offers their customers with spacious storage facilities and enable all of their customers to keep their goods in their secured and climate controlled warehouses. And, the company holds specialization in performing white glove services, furniture blanket wrapping, and the protection of any sort of flooring. With such services the company now tops the list of most preferred and reliable movers of the town. All you have to do is to just call or visit their website in order to make a booking for your next move with them. And, also get free in-home estimates about your move that too as per your own budget and preferences. 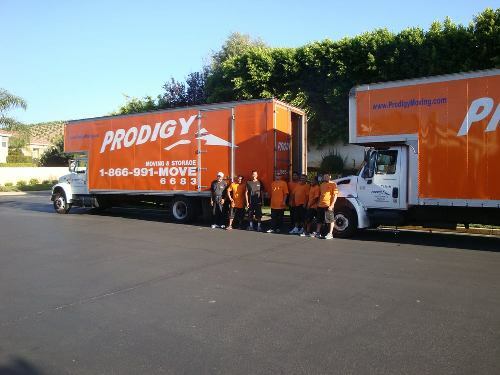 The company Prodigy Moving and Storage has been in moving industry for a long time and was established in 1999 with a team of hardworking, efficient and trained professionals. And, from then on the company is highly dedicated to making each of its client’s move easy, successful and hassle-free. The company proudly serves as the top local movers of Los Angeles and surrounding areas. Their hardworking movers and other knowledgeable staff are the roots of the company and are known best for performing all the moving-related tasks perfectly, be it planning a move or executing it. Since establishment, the company has come so far in terms of making a move successful and stress-free. And, today it is considered to be the preferred and the most reliable moving company of town which has made ample of customers happy and n number of moves successful with the help of their enormously good moving services. Barak A. has a long-term experience in the moving company and has also worked with many moving companies in Los Angeles before starting his own moving company. And, currently, he is the proud owner of Prodigy, the popular moving company of the town which is making numerous customers happy about the moving process. He along with the movers of the company strives to make each of their client’s move less chaotic and more enjoyable. 601 S Figueroa, Los Angeles.